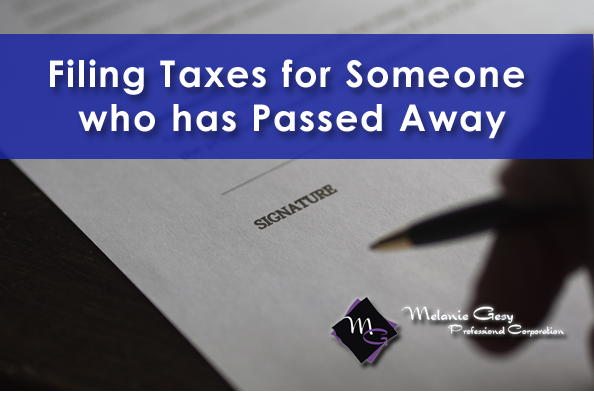 When grieving for a loved one the last thing on your mind is their tedious tax obligations. Here are some important steps to help you through! An executor (Personal Representative) is someone who is responsible to gather information about property, deal with debt the deceased may have, and follow instructions in the deceased will. One of the executor's responsibilities is to locate the deceased previous seven years income tax returns and provide the copies to a lawyer or accountant. If not done, the executor could be personally liable for any tax penalties for any tax dates that are missed. If nobody wants step forward to become the executor, the court will appoint an administrator to manage the deceased's estate. This person could be a spouse, common-law partner, or the deceased next of kin. Have you Notified the Government? Whoever the executor is must contact the Canada Revenue Agency (CRA) as well as Service Canada to provide a death certificate to both. This is a very important step so any government benefits or grants can be stopped immediately. You can call the CRA at 1-800-959-8281 or complete this form and send it to a tax service office to get more. There are 3 different returns that may need to be prepared, depending on the types of assets in the estate. Please consult an accountant to determine which of these returns are required. Final personal tax return (mandatory) - same as the regular personal tax return to report all income up to the date of death. Rights and things return (optional) - same as the regular personal tax return to report certain income earned from the date of death up to December 31 of that same year. Estate Tax Return (T3) (depends on the assets in the estate) - special type of return to report income earned by the deceased's estate after death. The executor must have a record of the deceased's income from the beginning of the year they pass away up to the exact date of death. Finding this information can be tricky, the executor may have to contact employers and other financial institutions. Any other tax documents like receipts must also be included. If the deceased passed away between January 1st and October 31st the filing is due by April 30th of the following year. If the deceased passed away between November 1st and December 31st the filing is due six months after the date of death. A clearance certificate is provided from the CRA, it validates that all debts of the deceased to the government have been completely settled or a security payment has been made. This certificate lets the legal representative (the executor) distribute assets without any risk of being personally liable for anything the deceased owes to the CRA. The clearance certificate can be requested ahead of time, but will most likely not be signed off until all tax fillings are complete. We know going through the grieving process can be rough. Call 780-995-5236 - we are here to help! Melanie Gesy graduated from the University of Alberta with a bachelor of commerce degree. She articled at a medium-sized firm where she gained knowledge and experience on small and medium sized companies. It was there that in 2006 she received her chartered accountant designation. In 2010 Melanie started her practice because she saw a need for friendly and affordable professional services for small businesses and entrepreneurial clients. Melanie has built her business around strong relationships with her clients and by helping them to grow and reach their goals. Copyright © 2019 - Melanie Gesy Professional Corporation. All rights reserved.